One major disservice that the mainstream media does through its political bias and negativity is that it neither prepares its audience for or explains to it events and trends that are likely to happen. When they do happen, the audiences are left confounded and dumbfounded. “That’s impossible. How could this have happened?” The case in point: the rise of Donald Trump. Another case in point: the continuing political survival and relative success of Donald Trump. Should Trump get re-elected in 2020 (not an outcome I necessarily believe in), the audience will be positively speechless. This is a problem in the United States, but it’s an even bigger problem with the international media, whose coverage of Donald Trump is overwhelmingly negative without any nuance and counter-narratives that are at least present in the American media. 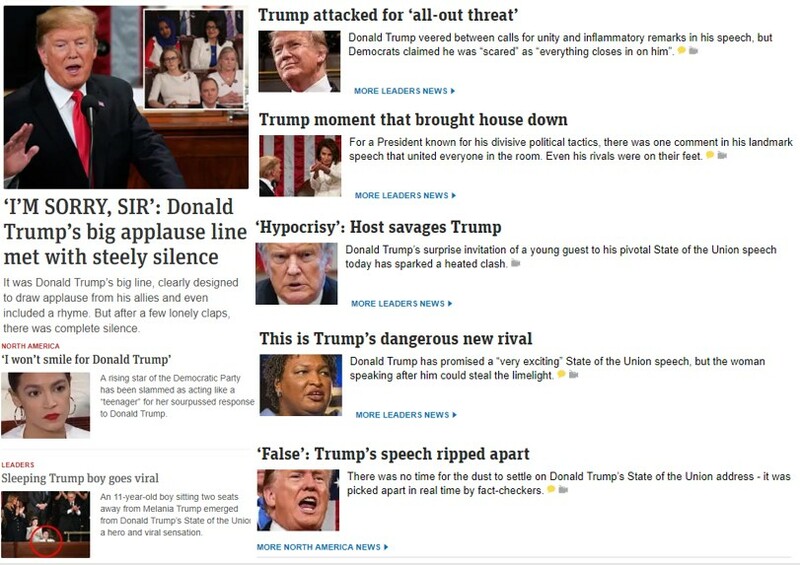 Only one story out of eight (“Trump moment that brought the house down”) is in any way positive. I’m not a cheerleader for Trump – you can read all my coverage of Donald from the early 2016 onward if you have doubts – but it strikes me as disingenuous that an average Australian scanning the news on News.com.au website will get an impression that the State of the Union has been another embarrassing failure for the President, like pretty much everything else he does if you believe the Australian media coverage. Maybe that’s something that News.com.au and other media outlets should be discussing and analysing in order to fulfill their ostensible mission to better inform their consumers instead running stories about a boy who fell asleep. Alas, Australians for most part continue to be none the wiser about what’s going on in the United States.